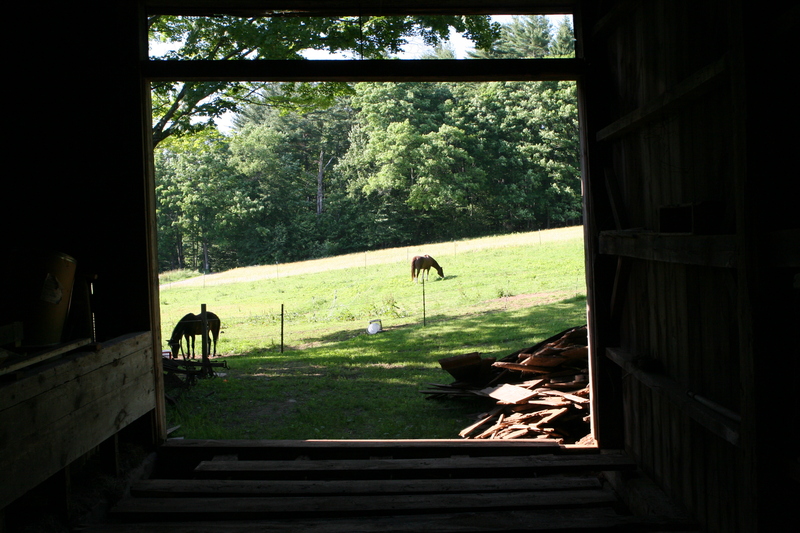 With horses in need of stalls, and a floor in failure, many of Mark’s June days have been spent in and under the back barn. The job is replacing the floor boards. 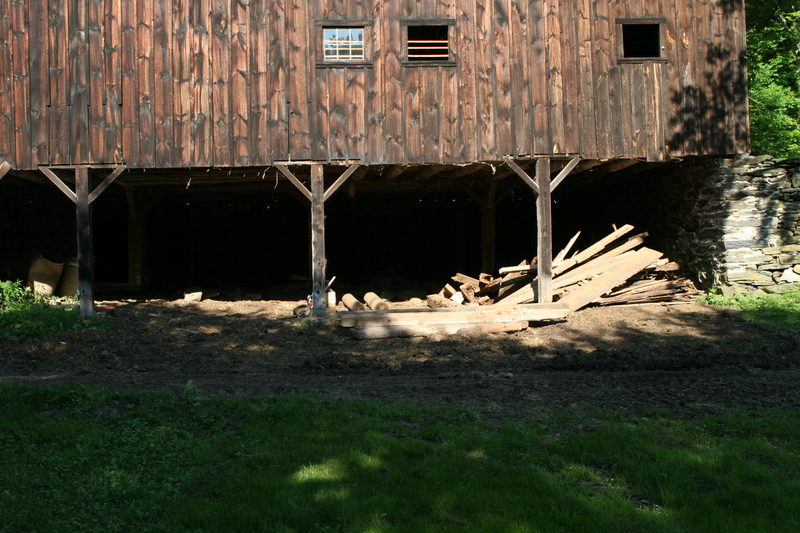 But as with most old barn renovations there is more, and more, than meets the eye. The 1″ sub floor and the 2″ floor boards were the first to go–a few long days ripping out nails and semi-rotten wood. Once the floor boards were removed, the joists no longer supporting the floor were exposed. So Mark cut new joists and reattached the joists in the outer sill. 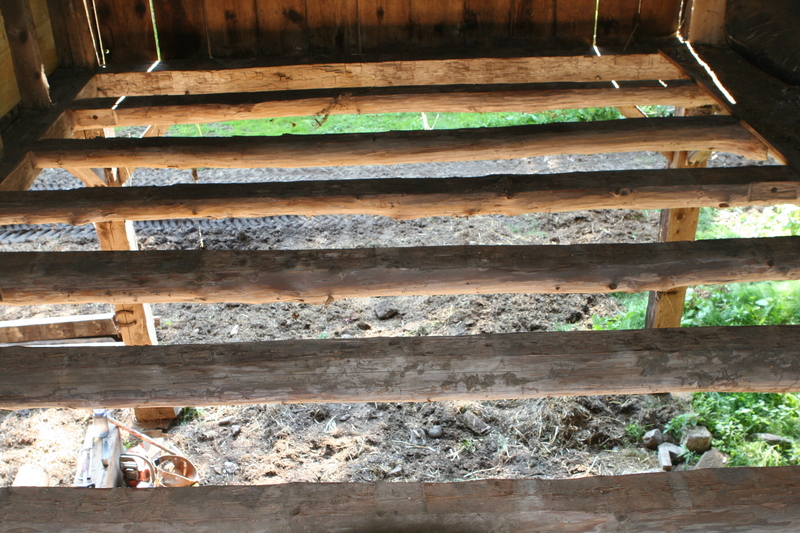 Mark also placed two additional support posts under the joists that support the main floor. Nathaniel helped with removing boards, and Ellinore calculated the board feet needed of 2″ hemlock. Old timers tell us that hemlock is the preferred floor. When nailed green, the wood rusts the nails to hold better and contracts to open up small cracks for urine to escape. So next week we should have a delivery of a thousand board feet of hemlock from a local sawmill. With advice from Andy Rockefeller (yes, that Rockefeller), a Grammar School parent and barn builder in Putney, we will put down the 2″ hemlock boards without a subfloor (the joists are 24″ apart); and this should start next week. 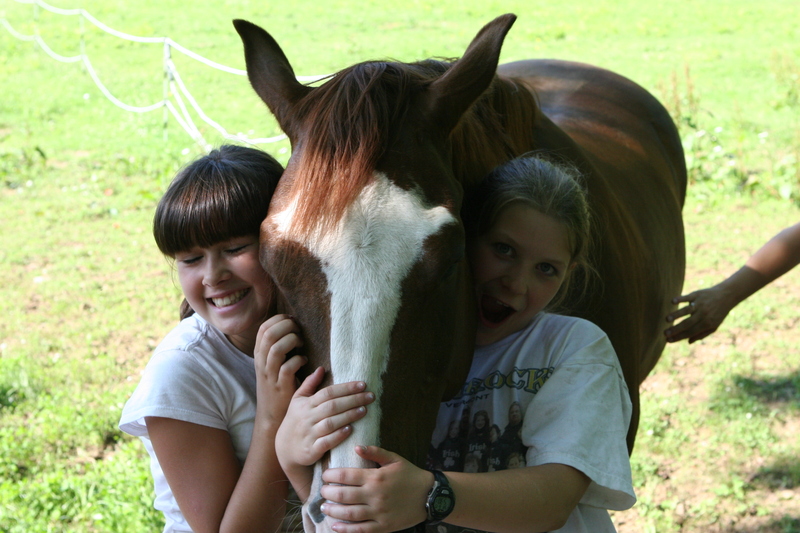 We’ll work in sections, doing the stalls when the horses are out in the pasture. Once the boards are down Mark will build the third stall. 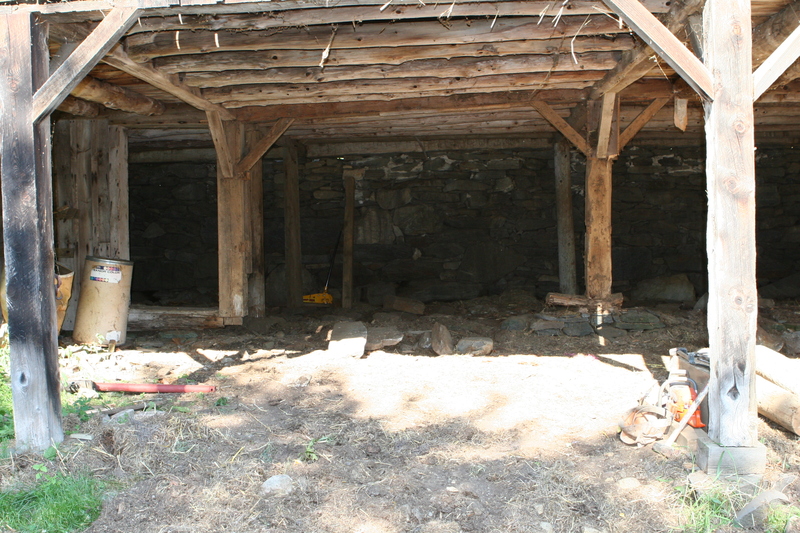 Then the work on the area below the barn will commence: supporting the posts with large stone, cutting mortise and tenon joints to hold the old to new wood; doing what we can to shore up the back stone wall; remove all the stones and retaining wall and regrade the floor, looking ahead to a winter home for the rams; and, finally, removing all the old wood from the premises. Then our attention will turn to the fields: haying, clearing the perimeter, reseeding, and building a semi-permanent fence. 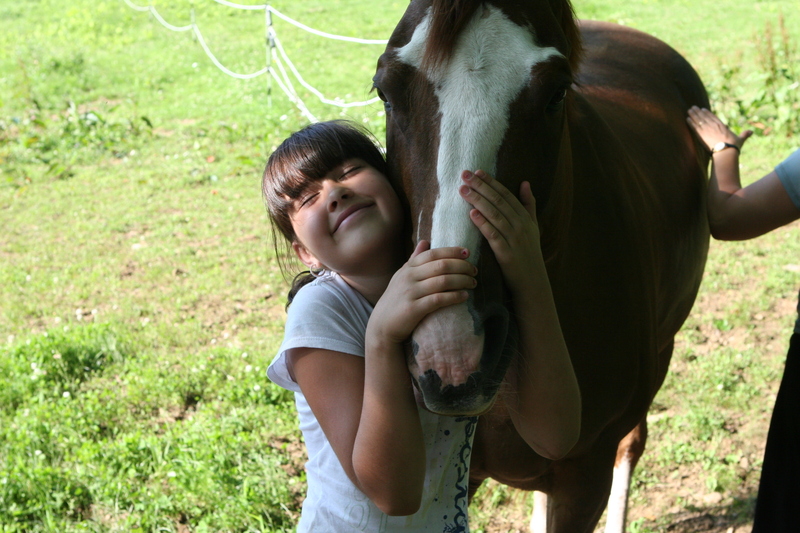 All for the love of horses! One Response to "Barn Boy"